(1) Provided that the geometry of the joints is within the range of validity given in Table 7.23, the design resistances of welded joints between hollow section brace members and channel section chord members may be determined using Table 7.24. (2) The secondary moments in the joints caused by their bending stiffness should be taken into account. 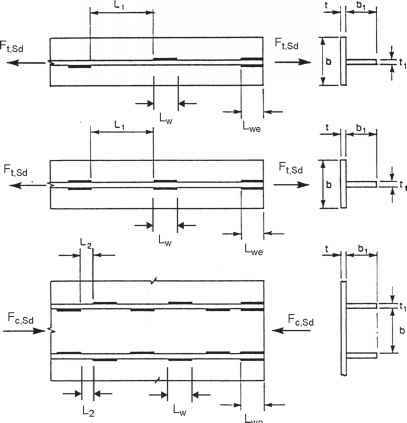 (3) In a gap type joint, the design axial resistance of the chord cross-section A?o,Rd should be determined allowing for the shear force transferred between the brace members by the chord, neglecting the associated secondary moment. Verification should be made according to EN 1993-1-1.